60 Hikes Within 60 Miles of Atlanta. The book lists trails close to the city along with some info on the trails, a few pictures as well as brief review of the trail. It is separated into chapters by region (Atlanta, NE of Atlanta, NW of Atlanta and South of Atlanta) and also by types of hike such as busy hikes, hikes with waterfalls, hikes with flowers, historic hikes and hikes by length. The book uses UTM coordinates for trailhead locations. I like the book a lot as it is a great reference tool, however it is quite out of date for many areas. Trail paths have changed for several trails, making the maps inaccurate. Fees have changed at many of the locations and places that did not have fees before now require parking or entry fees. Also, and I’m not sure how this is possible, the UTM coordinates they used for trailheads seem to be off in many cases when converted to Lat/Lon coordinates. Perhaps that is a conversion error but I’ve used several converters for various trails. I definitely recommend getting this book as a guide, just note that it is out-of-date and you should verify any critical data before heading out on a hike. I think it’s a great resource to locate hikes close to the city and it’s amazing to see how much we have right here in our backyard. Georgia has a lot to offer for hikers, not only in an abundance of trails but also in the variety of terrain and a wealth of Native American, Civil War and Civil Rights history. Pam and I want to thank you for your positive comments on our book, and for pointing out that the 2nd edition is out of date. We have been working with our publisher on updating the book. 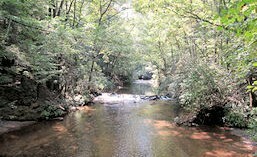 New hikes in the next edition are Indian Seats Trail, Pine Mountain Trail, Iron Mine Trail, Rome’s Heritage Trail and the Gwinnett Environmental and Heritage Center and should be available in April 2013. 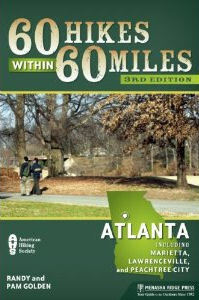 In the third edition we have updated every hike, all the directions (Atlanta’s ever-changing roads), and fees. We are also checking the UTM coordinates for the trails. If you would not mind posting the names of the trails you have had a problem with, I will check back in a few days and get their names. Thanks for the comment. Let me get a little data together and I’ll send you an email with some info I have.